I have written many times about the tendency for the market to follow various seasonal patterns. Frankly, it is eerie how often the S&P 500 winds up mirroring these historical cycles. 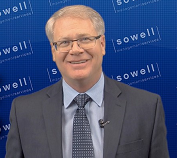 To be sure, the market doesn't always follow the seasonal patterns and therefore, it doesn't pay to trade heavily on what history suggests may come next in Ms. Market's game. However, since I've observed that the market does tend to follow cyclical patterns a fair amount of the time, I like to, at the very least, pay attention to what the cycles have to say about both the short- and intermediate-term trends. As you are likely aware, I follow a composite of historical cycles developed by Ned Davis Research. NDR combines the 1-year seasonal, the 4-year Presidential, and the 10-year decennial cycles in order to create their composite projection for each calendar year. 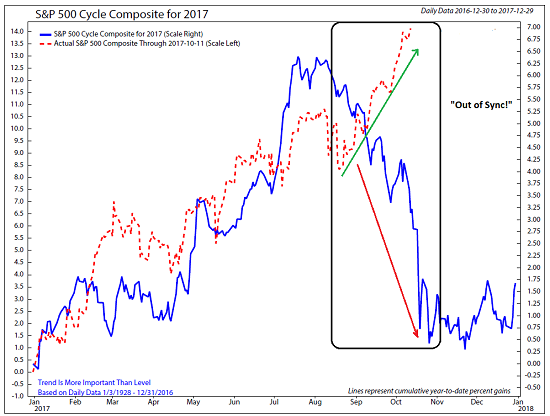 The bottom line is that the cycle composite winds up providing a pretty decent roadmap for the calendar year. However, Ms. Market is currently making a mockery of the seasonal patterns. Instead of the meaningful decline that was to occur from the beginning of August through late October, stocks have instead "melted up" in a slow, grinding fashion. Take a peek at the chart below and you'll see what I mean. To say that the market is currently out of sync with the cycle projection is a bit of an understatement, right? The question, of course, is, why? On Wall Street it is said that something everyone knows isn't worth knowing. In my opinion, this stems from the idea that once an idea becomes overly accepted or popular, it tends to (a) already be "priced in" to the market or (b) become a position that the fast money trader types simply "fade" or "go the other way" with. So, my explanation for the market's current divergence from the cycle projection is that (a) everybody on the planet knows that stocks tend to correct in the fall and (b) traders may be fading the trade. Another thought is that investors are simply focused on the fundamentals at this particular point in time. And with the economy expanding and earnings growing, stocks continue to advance. Yet another idea is that "performance anxiety" is setting in on Wall Street. With the S&P 500 up more than 14% on the year and the calendar quickly running out of pages, underperforming managers could be moving into "chase mode" where money is placed with the leaders in the hope that these stocks will help them catch up into the end of the year. And then there is the idea that the market is discounting the benefits of tax reform. Wall Street is already out with projections of what the White House plan will do for earnings on the S&P. The bottom line is that if earnings are expected to get another boost, then prices can follow suit. My guess is that stocks are benefitting from a pretty strong tailwind right now in the form of earnings growth, performance anxiety, and the expected benefits of tax reform. As such, I can argue that the dips will continue to be bought aggressively (I think yesterday was a good example of this). And with the caveat that stocks could easily pull back a couple percent in the near term for almost any reason, it looks like it may become tough for managers looking to put money to work to find an entry point in the coming two and a half months. But we shall see. 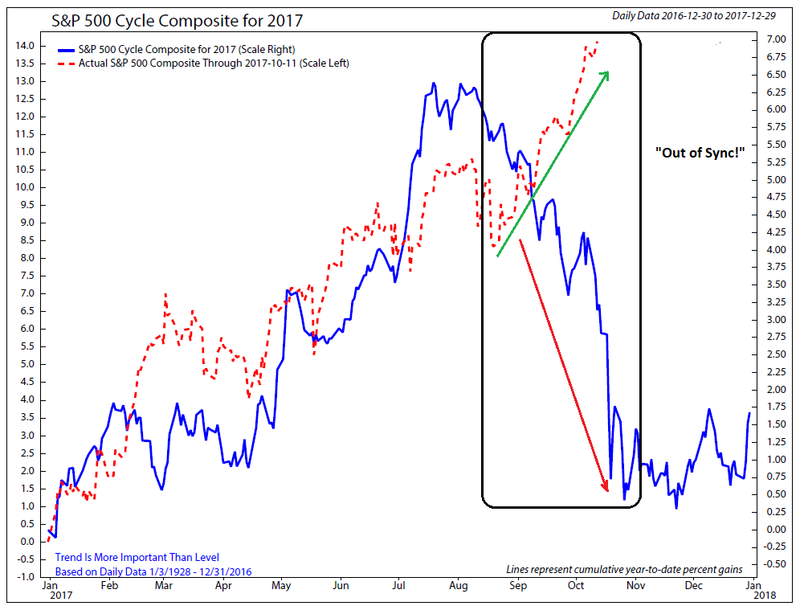 As a reminder, there is still some time left on the cycle composite's call for a decline and another earnings parade is about to begin. So, stay tuned, this is gonna be interesting!